Filler unit is 73″ wide (load side) x 61” long x 94″ high (±12”). Automatic rear traversing bag strap engagement and release system. Bag strap system pivots upwards for additional clearance after bag strap release, and prior to bag discharge. Unit features an abrasion-resistant carbon steel bag filler inlet tube with inflatable bag spout seal. Inlet tube includes a bag inflation system and dust take-off stub with actuated butterfly valves. Unit features a fully integrated carbon steel Mettler-Toledo gain-in-weight scale system. 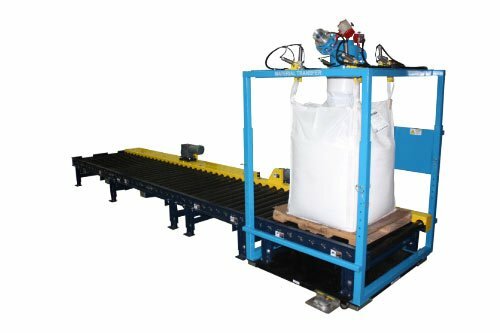 4,000# capacity CDLR conveyor to discharge filled bulk bags on pallets out of filler unit. 4,000# capacity CDLR discharge conveyor section after filler unit to accept filled bulk bags on pallets. 4,000# capacity x 164” long “Zero-Pressure” conveyor with three (3) 54” accumulation zones. All conveyors feature heavy-duty 3.5” O.D. x .300 wall carbon steel rollers with 1 1/16” hex axles. Allen-Bradley control system with Micrologix PLC and PanelView Plus 1000 color HMI touch screen. Hoffman NEMA 4 control enclosure features an Allen-Bradley lockable electrical disconnect.